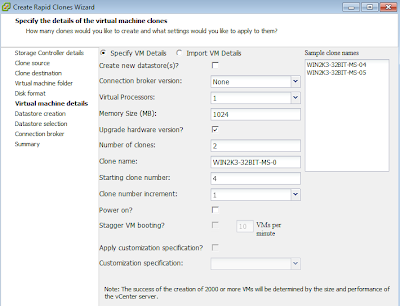 In part 1, we created an NFS datastore, now we’ll use the Rapid Clones feature of the VSC to populate it with some VMs. 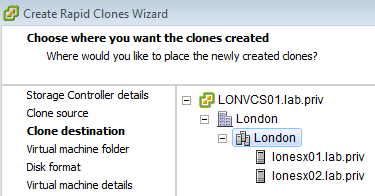 - Hit the “Create rapid clones” button. 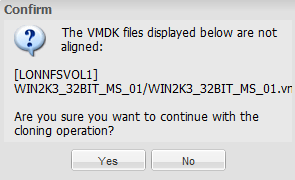 Note: One thing that’s very nice about this tool is that it will check disk alignment before starting, and warn you if the VM you’ve picked for rapid cloning is not disk aligned correctly (the clones would end up being similarly misaligned). Note ii: For the wizard, clones names can only contain A-Z, a-z, 0-9, and - characters! Note iii: If you already have saved customizations in ‘vSphere Client > Home > Management > Customization Specifications Manager’, and the correct sysprep versions or similar installed on your vCenter, the ‘Apply customization specification?’ tick box can be checked. Note: Clicking the ‘Advanced >>’ button allows you to specify different datastores for configuration files and disks. And that’s it. Wait a little bit and the clones are provisioned!